Often when you hear of people’s great accomplishments you find yourself reflecting on what your contribution to a better world has been. For the past 10 years I have worked as a tutor for UCanDoIT. Over these years I have met many wonderful students with various disabilities; each one coping as best they can, some in very challenging circumstances. Each learner has up to 10 sessions in their own home and, as a tutor, you do feel that a life has been changed for the better with these newly discovered computer skills. At the end of a day’s work you can go home with a high job satisfaction rating. One such learner was Cornelia who, at the age of 44, woke one morning unable to get out of bed and barely able to talk. After a great deal of effort she was able to communicate her predicament to a friend who called an ambulance and Cornelia was rushed into her local hospital where, eventually, a diagnosis of Cerebellitis was made. Cerebellitis is an infection in the brain that can cause permanent damage. In Cornelia’s case the infection caused problems with her speech and her ability to control her movements and may have been triggered by an ear infection. After 6 months of treatment and physiotherapy she eventually made it back to her flat. Life Changed. A team of carers now provide the support that Cornelia needs. Getting her out of bed in the morning and getting her dressed, helping her wash and brush her teeth, preparing her food and drink and weekly assistance to have a shower. At the time I was teaching her we were having a heat wave so travelling became a hot sticky adventure and energy levels were zapped with the heat. Cornelia was my Friday afternoon student and, no matter how she may have been feeling, always greeted me with a smile and a cheerful disposition. By the end of one particular lesson the high temperature had got to us both and I faced an uncomfortable journey home. As I left I casually mentioned that I would be able to jump into a nice cooling shower when I got home. It was at this point I realised how drastic had been the change in Cornelia’s life. Now confined to a wheelchair and reliant on others she would have to wait a week to have a shower with the assistance of one of her care team. Cornelia had been an old style film editor cutting the celluloid up and sticking it back together to make the finished film. She enjoyed going to the cinema and socialising with her friends. Her taste in music was varied and she loved going to concerts. Adam and the Ants had been particularly memorable. Cornelia dabbled at playing the piano and was a proficient artist having done a couple of adult education courses. She had also written several short stories. Nothing had been published but they had provided a great deal of pleasure in the creation. Technology is great when it works and you know how to use it. The basic skills of e-mailing family and friends, learning how to Skype, online shopping , online banking and the wonders of the world wide web provide the foundations of what is taught and the start of a changed life. 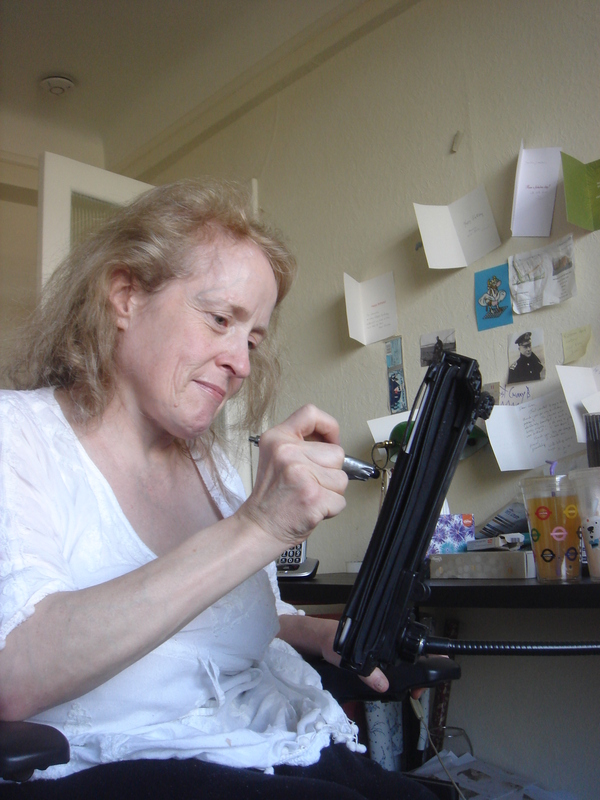 Reliance on the care team or friends to help get her out of the flat in the wheelchair restricts Cornelia’s independence and is to her the most infuriating aspect of her current situation. This life style will not change in the foreseeable future. Yet a dramatic life change has occurred thanks to an iPad, 10 lessons and an optimistic outlook. Although inwardly frustrated at why it had all happened to her Cornelia now feels blessed by her newly developed skills. A quick Skype chat to an old friend, checking for the cheapest price for a printer, finding out what local amenities are wheelchair accessible are just the start. A sketch sent via e-mail to wish someone Happy Birthday, a funky new rhythm created on an app and watching Adam Ant on YouTube. The door to so much more is now open. The much missed joys in her life of creating music, drawing and writing are now available again. Although not as good as the real thing Cornelia can now watch a sunset or a firework display on screen. The one regret Cornelia has is that she did not get into technology sooner. Now nothing is stopping her and her life is changed for the better. If ever asked what did you do today at work? I can honestly say I changed a life. This entry was posted in Disability, Learners, Tutors and tagged #a11y, accessibility, Cerebellitis, Disability, iPad. Bookmark the permalink.